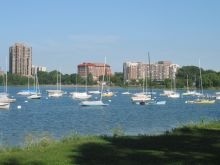 Lake Calhoun, Uptown Minneapolis: Lake Calhoun lies to the southwest of downtown Minneapolis, just south of the Kenwood neighborhood. The lake’s east bank is near the intersection of Hennepin Avenue and Lake Street in the Uptown neighborhood. The pay phone near Lake Calhoun mentioned in the story seems like a bit of an anachronism since there are few left in Minneapolis, but I believe that the phone I was thinking of when I wrote the story is still there as of Summer 2010. Uptown Minneapolis is a mostly commercial area separated from the lake by only a few blocks of upscale houses. Much like Lake Como in Saint Paul, Lake Calhoun is surrounded by a parkway that prevents any houses from being built right on the lake. Still, many mansions more than a century old line the parkway and have fantastic views of the shore.